Zinedine Zidane took some risks today at the El Molinón by rotating several key players in his lineup, but Real Madrid still found a way to get away with the 3 points, mostly thanks to a magical display Isco. The Spaniard was brilliant all match long scoring 2 goals, while Álvaro Morata scored the other goal for the Merengues. Real Madrid and Sporting Gijón clashed today at the El Molinón, with the Merengues pulling off an important 3-2 win to keep their advantage over Barcelona on the top of La Liga standings. These are sometimes the easiest games to lose focus in. Against a bottom opponent in the middle of a month where Madrid play against some of the best teams in the world, on the road with most of the starting lineup given a rest. Yet, this game will end up going down as one of the most important of the campaign, as Real Madrid were able to squeeze out a come from behind 3-2 victory over Sporting Gijón. Cristiano Ronaldo was rested for this Tuesday's Champions League second leg encounter against Bayern Munich. 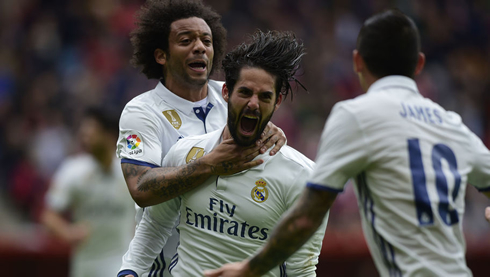 The man of the match was undoubtedly Isco, who may have had his best ever performance in a Real Madrid shirt. The little magician was the talisman today, he was everywhere defending when needed, dribbling past everyone in sight. Scoring two goals, not to mention the match winner in the last minute of the game. 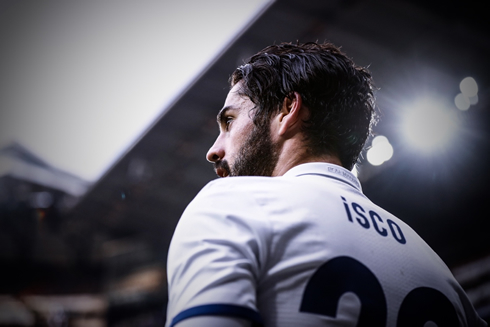 It was an astounding performance from Isco... We all know he has the capability of performing this well, but today his performance was a class above. Florentino Perez will be eager to offer him whatever he desires on his next contract at this rate. Real Madrid fell behind in the 14th minute from a goal by Dule Cop, but Isco's brilliant dribbling and finish would tie the match just three minutes later. The Merengues largely controlled the first half, but then struggled with their final ball as both teams entered the half at 1-1. Madrid, however, remained unfocused and a defensive mix up between Danilo and Sergio Ramos gave the impressive Mikel Vesga a free header, which he looped over Kiko Casilla. With 40 minutes left Real Madrid were now in dire straits, but as we've seen all season, the spirit lives on. Danilo made amends for his bad positioning earlier by delivering a great cross to the head of Alvaro Morata. The striker headed home and Madrid were locked in a 2-2 tie. 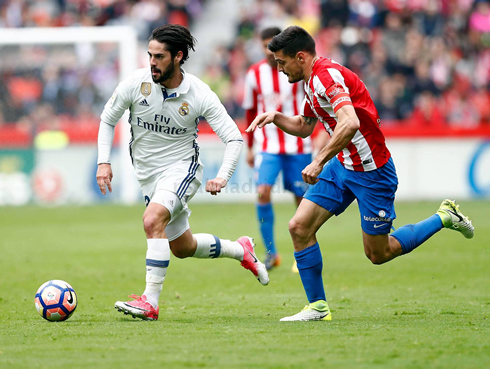 Madrid kept pressing on and Isco was at the heart of everything. He went on with a few Ronaldinho-esque dribbles today, just bamboozling the defense and putting his stamp on the match. But as the 90th minute drew closer, it was unclear if Madrid would get the victory. Yet, as we've seen all season, Real Madrid are the kinds of the remontada. And today it wouldn't be Ramos but Isco scoring a brilliant shot from outside the box as the clock hit 90 minutes, to give Madrid a 3-2 victory to maintain their lead in La Liga. It was the perfect capper to a brilliant match for Isco, a truly remarkable performance and one that is sure to secure his place in the side for the future. Real Madrid now look forward to Bayern Munchen next week and with Bale out, it would be a shock if Isco didn't start. 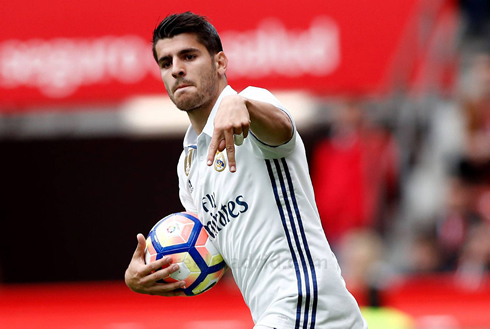 Attackers: Lucas Vázquez, Asensio, Morata. Cristiano Ronaldo next game is a Champions League fixture, on April 18 of 2017 against Bayern Munich. You can watch Juventus live stream, Real Madrid vs Bayern Munchen, Valencia vs Sevilla, Manchester United vs Chelsea, WBA vs Liverpool, and Werder Bremen vs Hamburg, all matches provided from our live streaming game pages.